LOGAN — A fire at the LDS Institute of Religion forced Utah State University students to evacuate the building this morning. The incident took place at approximately 9:45 a.m. in the kitchen on the second floor of the building. Flames caused fire and heat damage to many appliances and furnishings in the room. “There was so much smoke in the kitchen that they couldn’t even see,” said Lynn Hopkins, an Institute instructor. Hopkins said the stove in the kitchen is believed to be the source of the fire. “I don’t know if someone accidentally left the stove on or what,” Hopkins said. The Institute had been giving apples to students this week and a box of fruit was left on the stovetop. Hopkins said it is possibile the box was bumped, turning on a burner. James Butler, an instructor at the Institute, said the alarms in the building are set to automatically notify the fire department after detecting smoke. Butler said a few teachers and students who witnessed the accident used a fire extinguisher on the flames. The Logan City Fire Department then responded to the emergency. Authorities were unable to give a statement at that time. “Everyone got out quickly so that was good,” Butler said. Nick Christensen was in his Institute class when the smoke alarms went off. His teacher told students in the class to leave their backpacks and evacuate the building. Christensen, a sophomore, said he assumed it was only a test. “Then we got outside and were like, ‘Oh, there is a fire,’” Christensen said. 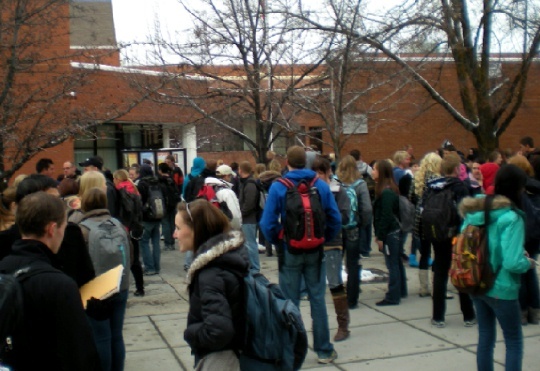 Students stood outside in the freezing temperatures until approximately 11:10 a.m. when they were allowed inside, but only to get their backpacks. Institute classes were cancelled for the rest of the day.